LOCATION Set on the north eastern side of Horsham, this three double bedroom end of terrace home is conveniently positioned for access to the A264, Junction 11 on the M23 and in turn Gatwick Airport. The property also benefits from being close to the popular Leechpool Primary school with the adjacent pre-school and is approximately 1.5 miles from both Forest Boys and Millais Girls secondary schools. The property is conveniently positioned within close proximity of the picturesque Leechpool Woods with cycle paths, walks and a large children’s play area just a short walk away. PROPERTY This three bedroom family home is arranged over three floors having been extended by the current owners. 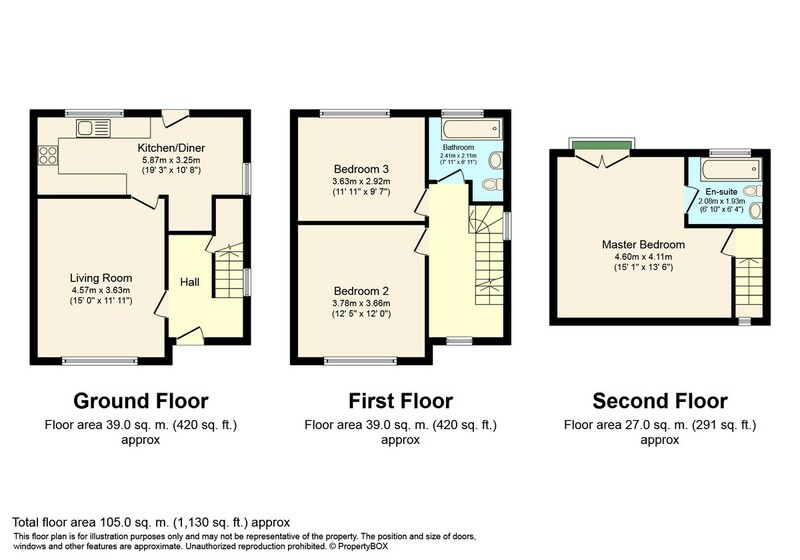 There is further potential to enlarge the ground floor ( stp ) which already comprises lounge with focal fireplace and kitchen / diner offering lots of storage and space for appliances. To the first floor are two of the three double bedrooms in addition to the family bathroom. To the second floor is the master bedroom benefiting en suite and plenty of eaves storage. This fine family home further benefits gas fired central heating and double glazing. OUTSIDE Measuring in excess of 70ft, the rear garden enjoys a South East orientation, has two patios, a summer house, and is wood panel enclosed with gate to the front. To the front of the property is hardstanding for three vehicles and gated access to the garden via the side.